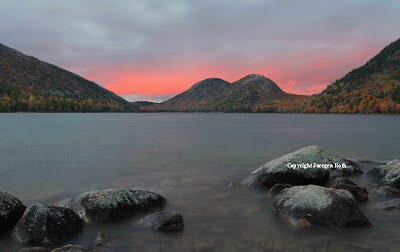 Upon arrival to Bar Harbor and Acadia National Park in Maine during my last visit, I was not fully settled on where to go for my evening photography shoot to capture these beautiful moments and Images of Acadia National Park. The sun still peaking through a partially cloudy sky I was evaluating Cadillac Mountain or Jordan Pond and the Bubbles. At the turn to Cadillac Mountain I followed my Photographic Instinct and went straight towards Jordan Pond. From the parking area at the Jordan Tea House it is only a short walk to the beautiful shoreline and one of Acadia's Iconic Photo Locations. There are many rocks at the shoreline that make for fabulous landscape photography foreground features. Almost instantly after setting up camera and tripod the magic unfolded in front of me. The sky turned orange from the sun setting below the clouds and I started capturing this wonderful outdoor experience and moment with my camera. The Mother Earth spectacle did not last long and I probably exposed a handful of images. I applied a Split Neutral Density filter to overcome the high contrast of the dark foreground and the brighter sky with the 2 hills at the other end of Jordan Pond: South and North Bubble. An aperture of F/29 combined with an ISO 100 setting provided the desired Depth of Field from foreground to the horizon and a shutter speed of 10 seconds. The long exposure time guaranteed a silky water effect of the pond while rocks and mountains remained in sharp focus. During post processing I minimally adjusted lighting, contrast, and color saturation before sharpening the final image.